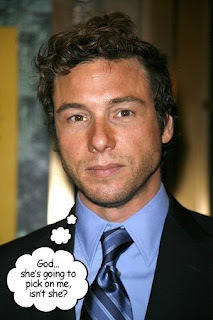 There's going to be yet another cooking competition on Bravo, this time featuring our favorite brownie recipe-maimer, Rocco DiSpirito! ACCLAIMED CHEF ROCCO DISPIRITO HEADLINES BRAVO DEVELOPMENT OF NEW COOKING SHOW "ROCCO'S DINNER PARTY"
NEW YORK, NY - May 27, 2010 - Acclaimed chef Rocco DiSpirito partners with Bravo for development on a weekly cooking competition series, "Rocco's Dinner Party," in which DiSpirito sizes up some of the country's most promising aspiring chefs to see if they have the chops to impress at a private dinner party attended by his discriminating guests. Notional, an IAC company, is teaming up with Bravo on this project that offers an exciting new twist on the culinary competition genre as up - and - coming chefs are given the opportunity to throw a memorable soiree for one of the culinary world's most influential figures. The chefs will hail from all walks of lives - from restaurateurs to caterers to self - taught foodies - and the winner of each episode will be awarded with a cash prize. For more information, visit www.BravoTV.com. Follow us on Twitter at https://twitter.com/BravoPR. "We love this concept because it continues Bravo's goal of providing additional forums for creative industries like the culinary arts, with a dramatic personality like Rocco DiSpirito at the head of the table" said Cori Abraham, Vice President, Development. Each episode will feature four different chefs who will be tasked to create their favorite dish for DiSpirito, and DiSpirito will eliminate one chef following the task. Next, DiSpirito will announce the week's dinner party theme, and the three remaining chefs will create an appetizer and also present their proposed menu for the theme, with one more being eliminated after this task. The two remaining chefs are given the opportunity to create a complete menu and decor incorporating the week's assigned theme. Who will create the best menu to impress DiSpirito's guests, many of the most influential tastemakers today? Who has the attention to detail to create a flawless atmosphere and memorable experience for the dinner party? DiSpirito, a gifted and accomplished chef and author, graduated from the Culinary Institute of America, apprenticed with iconic chefs and then jumped into the New York restaurant scene. DiSpirito has operated numerous restaurants including the three - star Union Pacific, for which he appeared on the cover of Food & Wine magazine as "Best New Chef." DiSpirito is well known to television audiences, starring in NBC's "The Restaurant" and making numerous appearances on programs including "The Tonight Show With Jay Leno," "Today," "The Martha Stewart Show," and many others. DiSpirito has also been a guest judge on Bravo's Emmy and James Beard Award winning series, "Top Chef." DiSpirito has written six cookbooks, receiving the James Beard Award for Flavor. His most recent book - - Now Eat This: 150 of America's Fave Comfort Food All Under 350 Calories - - hit the number one spot on the New York Times Best Seller list. "There is no greater gift or gesture than to cook for another human being," said DiSpirito. "My favorite moments are when I am entertaining for friends and loved ones. This partnership with Bravo brings to bear all I love about the craft and artistry of cooking in a setting where I am most comfortable - - the dinner table."